With the much-celebrated Star Wars reboot, J. J. Abrams takes over where George Lucas left off. And what can we say of his efforts? Abrams has now a robust reputation for breathing life back into dying franchises, like Star Trek, and introducing them to a younger, higher energy generation. In the case of Star Trek, I’ll begrudgingly admit that there was some true innovation there, but in the “The Force Awakens,” he simply dishes out what people wanted to see more of—a ripping off of the original Star Wars movie themes and reselling them to the public…without the public knowing it. It’s been more than 30 years after the fall of Darth Vader and the old Empire, but the new power struggle this time around is only a repackaging of the old one – passing through the Republic stage, to now a “First Order” phase (I can only imagine this means the new empire thinks they are so badass that they discount the efforts of their predecessors and call themselves the “first”). These enemies are as or more dramatic than they’ve ever been portrayed before, but let’s look at the cast overall because, well, that is where the film’s best writing shows itself. “Rey” (Daisy “Scrawl” Ridley), a scavenger from the dessert planet Jakku, finds a BB8-model droid that appears lost. As the story congeals, it comes known through a run-in with a defector stormtrooper named “Finn” (John “Attack the Block” Boyega) that the droid has the information of the whereabouts of the long, lost Luke Skywalker who is now on the verge of being considered a myth, but may be the only hope. So you see how the battle between the Resistance and the First Order becomes one eerily familiar! So it’s not original, but this primed-and-readied Star Wars spitfire has as big of ambitions as that of the very first film. And what do we get in this action-packed bag? You already know. Try an expectedly steady supply of nostalgic regurgitations and of repeating plot-points…and even lines that recall many of the same things said from the first Star Wars movie (1977), many of them verbatim. But, hey, let’s give credit where it is due; the new film is, for the most part, finely acted and enjoys smoothly progressive transitions from beginning to end that make it emotionally moving when it needs to be, and exciting. The pacing is flat-out excellent. No one is going to come even close to being bored, and the leads (not the originals) command a level of respect that puts it “far, far away” from episodes I-III, which were nothing but awful. And don’t get me started on Jar-Jar Binks—who is wonderfully absent from this film. The one (and only) thing that stands apart from the older movies is the special effects. Lawrence Kasdan, who helped to bring us The Empire Strikes Back and Return of the Jedi, can almost be seen in meetings pitching a clipboard list of stuff grabbed right out of the previous films. Creatures with tentacles, sandy junk-yard planets, and droids carrying priceless intel, and another death star…oh come on! Between action scenes, we are given plot explanations that, quite honestly, come close to working. And with the originals in the cast (Carrie Fisher, Harrison Ford, and the voice of Anthony Daniels as C-3PO, which hasn’t changed much), all they have to do is “phone it in.” And that’s what they do. Minus their stiltedness, the new cast hits some high marks; Ridley and Boyega do much to offer the support this movie needed. 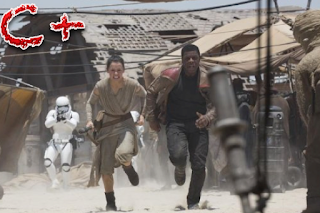 The dynamic screen-appeal of Boyega gets this film a grade bump! Many aspects of the plot make us wonder how or why some things could even be done. Take, for example, the Millenium Falcon, sitting idly in a junk-yard for years and suddenly being hijacked, flown around, repeatedly crashed into the terrain, and then flown into outer space at warp speed without serious issues. That is only one of many hard sells here, but the bigger problem: There is not much original material to work with. What am I supposed to do about that?